On Christmas day we heard the pitter-patter of little feet at our house. No, not reindeer, nor new babies. Instead, we're rabbit-sitting Carrot and Bear for a week, until Max's preschool teacher returns from vacation. 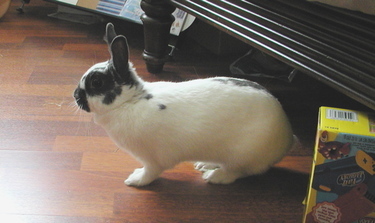 Carrot and Bear are something like Dutch dwarf rabbits, they don't grow too big. They're a nice size for kids to hold. They're very sweet, hopping around the living room, occasionally doing 4-feet-off-the-ground little leap-kicks. They also seem unperturbed by the 4 circling felines. I've never had rabbits before, only cats. It makes me realize that one mammal is not the same as another mammal. For instance, I have many questions. Such as: why does Bear try to gnaw the collar off my sweatshirt? Is it normal for them to poop *so much*? Is that reddish-brown, foul smelling liquid in their cages urine? Will there be problems because I was clueless and accidentally let Bear and Carrot "get it on"? It was just once, and very very briefly, so I'm hoping nothing...um...happened. If you have experience with rabbits and can enlighten me, please do! I don't have any pictures of Bear yet, he's a pretty solid brown in color. He's the more cuddly of the two, we sometimes watch TV at night together, at least until he starts nibbling me. Carrot was out for these pictures during her cage-cleaning. After the first incident of "getting it on", I'm not letting them out at the same time anymore. I'm also a little too worried about having two tasty snacks out amongst the four ravenous predators in our house. I was a little surprised at Zhinka. She's normally the most reserved cat, but today she was in full pounce and attack mode. At least until she actually got close to Carrot, and then was very confused and backed away. It seems that instinct got her part of the way there, but then a lack of experience won out. Not that I'm complaining. I really do want to return two live rabbits with all their limbs intact. This afternoon Max and I made a mini-yurt, after last night's bedtime read of Wonderful Houses Around the World, and reading about the yurts on the grasslands of Mongolia. Max saw the pictures and asked if we could make one, a big one, "what is big enough for all of us to live in." I said we could start with a small model. The real one is covered in wool felt, and of course I saw that and immediately was drawn to making one. Anything made out of felt can't be bad, right? Here's the interior framework, made up of too-large popsicle sticks. We obviously needed thinner sticks, as these were too long and too fat to curve nicely around the empty olive jar we were using as a form. 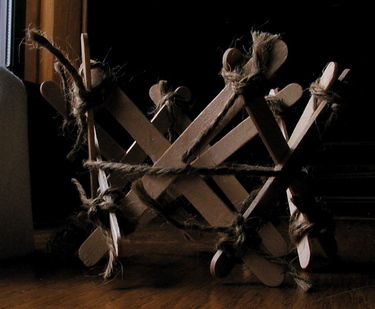 The pieces ended up too far apart to glue them together except at the intersection of each pair of sticks. So we liberally applied string and tied away. 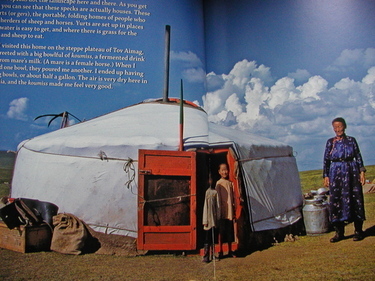 The picture from the book. Definitely more structurally sound than ours. Although our final product is not very aesthetically pleasing, and definitely won't be much use as shelter, I think this craft was a success. Max is learning about scales of things, what a model is, how much work a life-sized house would take to construct. So it was a good learning activity. However, he still wants to build a big one. Max made King Apple-Walnut in preschool yesterday. Isn't he cute? 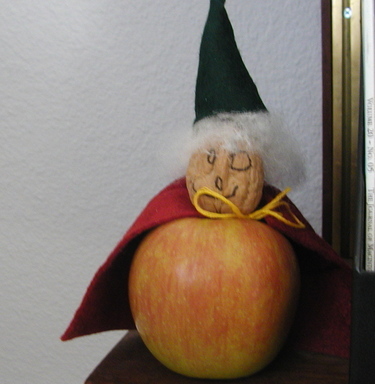 To make, you need an apple, a walnut, a toothpick, and some clothing materials like felt and fleece. Draw a face on the walnut in black pen. With the toothpick, poke a little hole in the "top" of the nut, the opposite side from the pointy end. Cut the apple stem off (or at least nearly so). Take the toothpick out of the walnut, then poke it into the apple, where the stem is. Put the walnut on and push down until it's flush with the apple. Now clothe your creation. At school they made felt capes with a simple hand-done running stitch around the top edge. The ends of the thread are left long and used to tie the cape around the "neck". 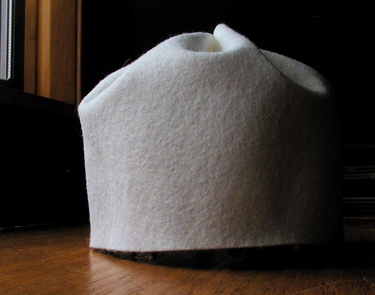 Fleece (or polyfil stuffing) was hot-glued to the walnut head. Max made a pointy hat from felt (hot-glued closed, and then hot-glued to the hair), but other kids made crowns out of a bit of fancy ribbon. The king's head keeps falling off, I may try hot-gluing that to the toothpick if I can find my glue gun. 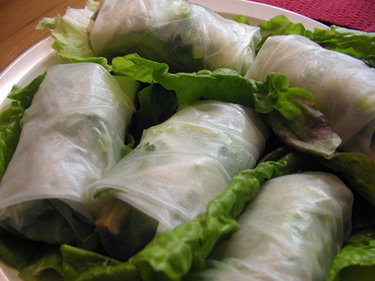 Tofu apple spring rolls, another recipe from the Vegan Lunchbox cookbook. This was not a quick recipe, it took me almost 2 hours to put together, but I can be notoriously slow in the kitchen. In the end it was well worth it. After the usual 3rd degree (What is this? Have I had it before? Do I like it? What is this green/white/other-white stuff? Do I have to try it? ), Max decided it was delicious and asked dad and me to stop eating so he could have the rest tomorrow. Which we didn't do, because we were hungry and liked them too. Not to worry, there were plenty of leftovers. My back/neck/shoulder are recovering from my latest bout of back/neck/shoulder problems, but not quite as quickly as I had thought I would. But now I'm finally back to mostly pain-free, so that's wonderful.